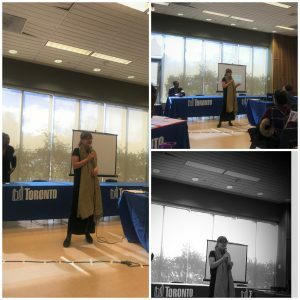 10/2018 During the AFCC-O Conference on October 19, 2018, we had an information booth set up at the Toronto Reference Library. 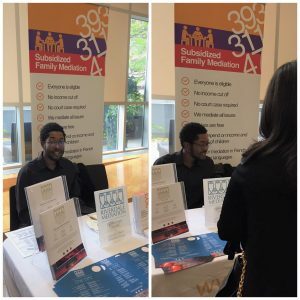 mediate393 employee, Rhodes Thompson-Chase, was there to provide information about our subsidized family mediation services. 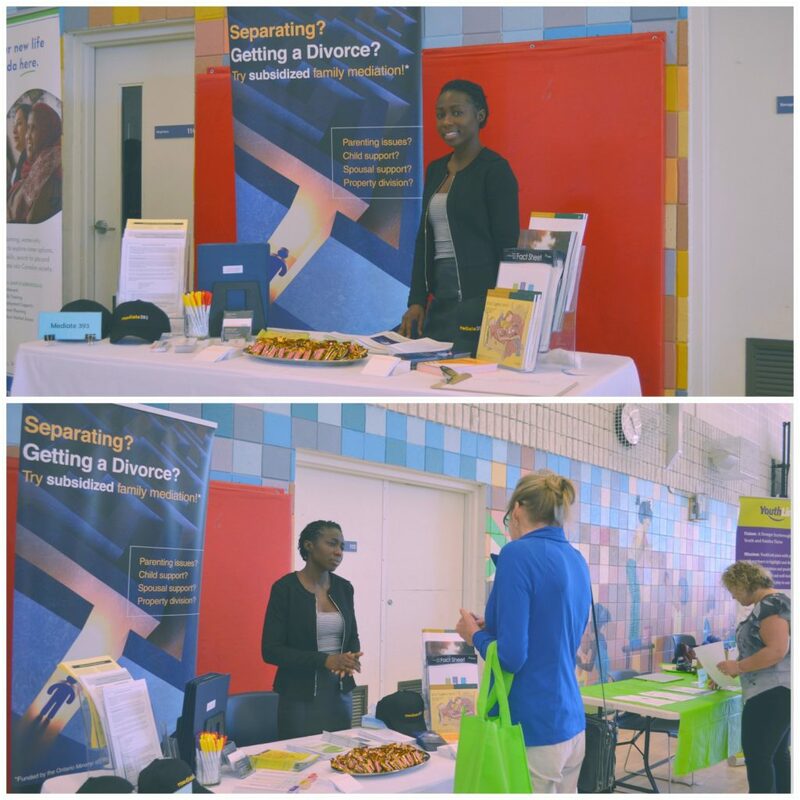 10/2018 Information Referral Coordinator (IRC) Frances Maychak attended the “Support Matters: Resource Fair for Single Parents” at the Burrows Hall Community Centre in Scarborough. Frances was not only there heading the mediate393 information table but also delivered a ten-minute presentation about our subsidized family mediation services. Snapshots from mediate393’s “Annual Staff Get-Together”. August 2018. 04/2018 We will be holding two Agency Fairs during Spring 2018! The fairs will be held at the following locations: May 25th 47 Sheppard Ave. courthouse 11:00 am – 2:00 pm June 7th 311 Jarvis St. courthouse 11:30 am – 2:00 pm It will be a great opportunity to connect with and learn about local services and community organizations that work with families in Toronto. Take home resource materials and light refreshments will also be available. 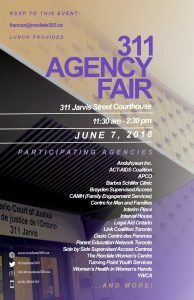 We have invited a wide range of agencies to join us on June 7th: healthcare providers, family lawyers, mental health counsellors, newcomer services, advocates against domestic violence, youth justice organizations, parenting program providers and more. We would love to have you join us. 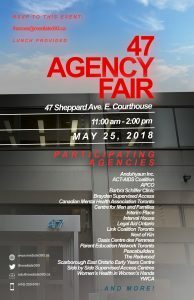 Please RSVP for the 2018 Agency Fair and direct any questions or requests to frances@mediate393.ca. 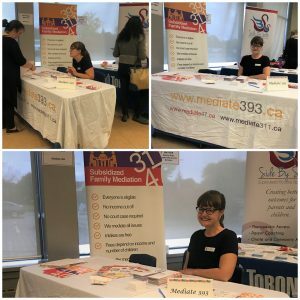 06/2017 Our Program Coordinator, Kerri-Ann Mitchell (below), represented mediate393 to promote mediate services at the 2017 Health & Information Fair on June 7, 2017. 01/20/2017 – mediate393 inc. is currently seeking qualified professionals for the role of Information Referral Coordinator (IRC), and accredited or certified family mediators, to work in Toronto’s courts, particularly 47 Sheppard Avenue and 311 Jarvis St. locations. 11/11/2016 – mediate393 roster member Shely Polak and Gregg Fenten were recent guests on “Los Vecinos” a CHHA 1610 AM radio program. With Shely speaking in Spanish, and Gregg in English, they discussed family mediation, options to going to family court, as well as responding to callers regarding their challenges with high conflict situations and about the refusal of a parent to pay court-ordered child support and in dealing with Family Responsibility Office. “It was a productive conversation conducted in two languages,”, said Gregg. 10/26/2016 – Popular Toronto radio personality Barb DiGiulio speaks with Hilary Linton of Mediate393 about the benefits of mediation rather than going to court when ending a marriage, plus the Family Dispute Resolution Institute of Ontario (FDRIO), and Family Dispute Resolution Week (www.FDRweek.ca), Nov. 21 – 25, 2016. “The Family Dispute Resolution Institute of Ontario (FDRIO) is doing important work to raise awareness of alternative dispute options and to change the way that people think about conflicts and how to resolve them..” – Premier Kathleen Wynne’s Greeting video for FDRweek and FDRIO Conference: https://www.youtube.com/watch?v=Gsz30Y10IAw Check out www.fdrio.ca for more information on FDRweek 2016. Join the#FDRevolution! In a recent article published in the Toronto Star and the National post, entitled “Help for those going it alone in family court”, MSC (MySupportCalculator) mentioned mediate393’s subsidized services. 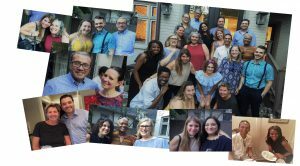 Snapshots from mediate393’s “Annual Staff Get-Together”. July 2016. On January 29, 2016, mediate393 roster member Shely Polak was a guest on Voces Latinas, a Spanish radio talk show in Toronto to talk about Mediate393 and what it is like being a roster mediator. During the interview, Shely also discussed the types of services offered by mediate393, and their team of roster mediators. The 2015-2016 schedule for the 311 Open Bar Series available here! Our Family Law Resources reference document was released December 2015. The resources document is exclusively available to the mediate393 website. Click here to view it. Our court-connected mediation and information services were featured in the ADR Update (Summer 2014). Announcement: LAO introduces separation agreement certificates and independent legal advice certificates. Starting on July 3, 2014, Legal Aid Ontario (LAO) will issue certificates to cover up to 10 hours for the negotiation and creation of a separation agreement to settle custody, access, support and property issues. LAO is also expanding the availability of independent legal advice certificates for mediation clients across the province. This service can now be provided by any family panel lawyer, and in some cases, may be available to both parties. For more information, please visit the “Information for Lawyers” section on LAO’s website and select “Family Law Services” on the side panel. Our court-connected mediation and information services were featured in the latest ADR Update. Read all about us in the Lawyers Weekly! Announcement: Independent Legal Advice for Mediation Clients through Legal Aid Ontario Legal Aid Ontario (LAO) is piloting the use of special duty counsel authorizations for mediation clients to receive independent legal advice (ILA). The pilot, which will be available in this district and 13 other locations, will have LAO covering the cost of a Family Law Information Centre duty counsel family panel lawyer for up to six hours before, during and after mediation to help reach a sustainable agreement and transform it into a legally-binding document. Call LAO’s toll-free number at 1-800-668-8258 for further information. LAO will direct eligible clients to a list of available panel lawyers. For more information, please visit LAO’s website. The Family Law Bench and Bar Committee at 393 University Avenue formally unveiled some fabulous new art on the 9th Floor. Students from Claude Watson School for the Arts created acrylic canvas pieces representing the 10 provinces and 3 territories of Canada. These pieces were inspired by Canadian artist Ted Harrison. 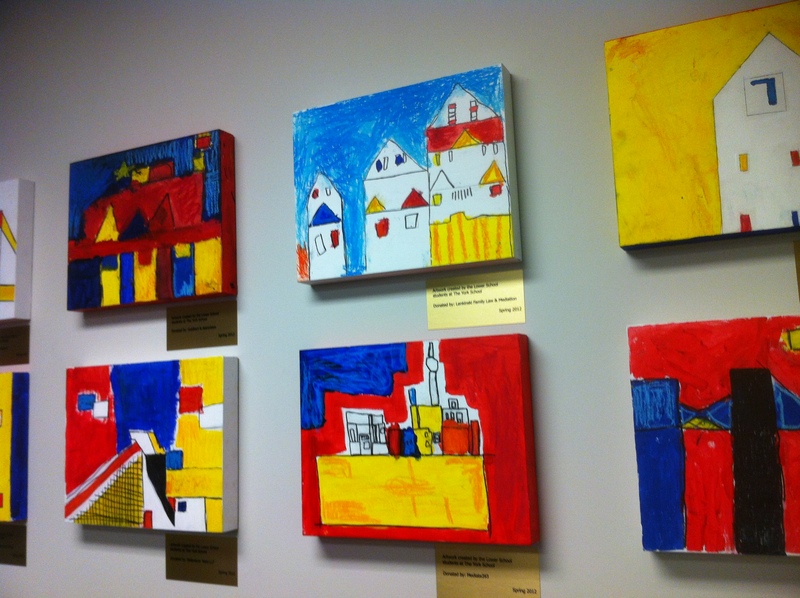 Students from the younger grades (Lower School) at The York School contributed 20 multi-media pieces. There are bold, Mondrian-inspired pieces, colourful 3-D representations of Canada’s geological diversity as well as Lawren Harris inspired works, brightening up the newly renovated 9th floor. Being in court is hard for many families, and the introduction of these new pieces is a part of achieving the goal in ensuring that the Superior Court of Justice Family Court in Toronto is as welcoming as possible. The pieces were all done collaboratively, mirroring much of the efforts that are strived for amongst those in the Family Court in Toronto. The artwork was sponsored by lawyers or legal/mediation firms, which are recognized by the Bench and Bar through a plaque beside each piece. One of the paintings featured here (bottom row, center) was sponsored by mediate393 inc., which was done as a representation of Toronto’s skyline. Be sure to walk the halls and admire all the wonderful pieces on your next visit to the 9th floor. On April 29th, Roster mediator Christine Kim was a guest on 1610 AM radio show hosted and produced by one of the Family Law Information Centres Information Referral Coordinator’s, Gregg Fenten. The topic was on Parenting Coordination and high conflict families. The Mediation Station program is live on Sundays 8 to 9 p.m. on CHHA 1610 AM Voces Latinas. Executive Director Elizabeth Hyde was also a guest on the show back in January.